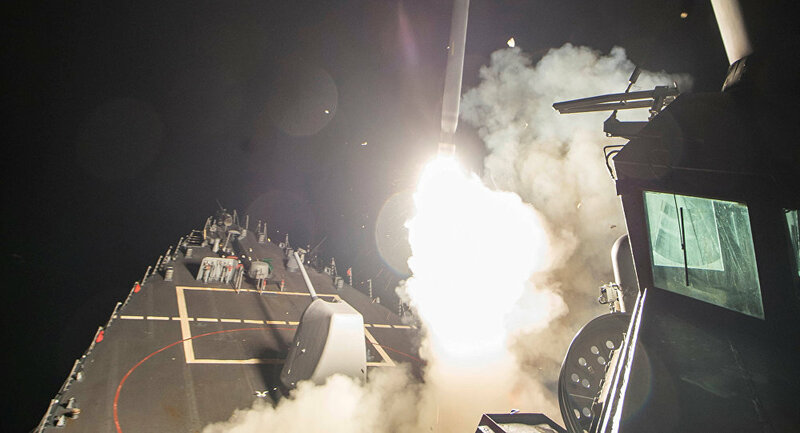 The United States has launched dozens of Tomahawk cruise missiles at an airbase in Syria, the Pentagon confirmed late Thursday. Around 60 Tomahawk cruise missiles were launched on Thursday night at the military airfield in Ash Sha’irat 38 kilometers southeast of the city of Homs, NBC reported, citing US military officials. US military ships in the Mediterranean launched the strike between 8 and 9 pm ET. Pentagon released a footage of the attack, also eyewitnesses are posting on Twitter videos with view from the ground. ​​On Tuesday, an alleged chemical weapon attack in Syria’s militant-held Idlib province claimed the lives of some 80 people and inflicted harm on an additional 200 civilians. The Syrian National Coalition of Revolutionary and Opposition Forces blamed the Syrian government troops for the attack, while Damascus has refuted these allegations. According to officials, Washington thinks Tuesday’s alleged chemical weapon attack was launched from the airfield targeted in the US strike. US Secretary of State Rex Tillerson has said "We feel the strike itself was proportionate." Speaking on Thursday night, US President Donald Trump confirmed he ordered the strike, reiterating claims that the Syrian government was behind the chemical attack. Syria's government repeatedly stated that it never used chemical weapons, claiming that terrorist groups were releasing deadly nerve agents in their fight with the Syrian Arab Army. Russia's Ministry of Defense alleged that deadly gas was released in Idlib on Tuesday after Syrian military aircraft bombed a facility that rebels used to produce chemical weapons. Following a chemical weapon attack in Syria’s East Ghouta in 2013, when hundreds of people were killed, Syria joined the Convention on the Prohibition of Chemical Weapons. This was the result of an agreement between Russia and the United States on the destruction of chemical weapons in the country under the control of the Organization for the Prohibition of Chemical Weapons (OPCW) and stopped the US military intervention in Syria. In January 2016, the OPCW announced that Syria’s entire chemical weapons arsenal had been destroyed. However, in June 2016, the US State Department released a report stating that Syria continued to use chemical substances against citizens, and could have retained a chemical weapons stockpile.